Just buy some.. Minimum 3x profit..
Not in the mood for theories and their explanations.. If you can't see the obvious, then words will not remedy that.. Happy HODLing..
Not much time, since it's actually already started.. The chart does seem to have dug quite the mine shaft and at long last.. GOLD.. It's likely to double in value within the next couple of days.. Who knows.. Possibly even today.. Early entry is key, so get yours..
1st Target for ZCL: ~ 0.00305000 - 0.00309000 600% Potential Profit Not a bad day at the office..
Next expected target for AION on Binance: ~0.0006000 - 0.0006050 100% Potential Profit Now's the best time to buy.. Holding onto it wouldn't be a bad idea, but to maximize profit, look to sell near the target level..
1st Target for XRP is at the pink line.. Expected level is around ~0.00014230 - 0.00014250.. 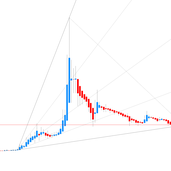 It will depend mostly on BTC how deep the retracement, if any, will be.. I expect BTC to come out swinging, so let's hope for fireworks..
Now's the time to get into TRX.. Here's a link to follow progress: www.tradingview.com Open it and don't close or refresh.. Sell when it gets to the pink line.. Pretty certain that XLM is about to start it's next run.. As always, look for the pink target line.. Of course there might well be a couple of stops on the way.. I'd imagine the breaks to become stronger and more stable as they progress.. Good luck..